Today sees the release of the latest major version of MDaemon, the popular email server for Windows and alternative to on premise Exchange. Like all MDaemon releases, the developers at Alt-N continue to add new customer requested features and enhancements. Here is a quick overview of just some of the features end users and IT administrators will find helpful. 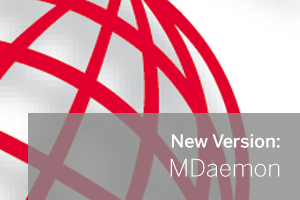 A more comprehensive list of all new features and enhancements can be viewed in the MDaemon Release Notes. MDaemon now offers end-to-end encryption of your emails and attachments with Virtru (initially this is integration with Worldclient however the service works well for Outlook Connector users too). Our resident technical guru Neil Perry has just written a blog post on it here so I’d highly recommend taking a look at that if you’re keen to know the ins and outs of what it is and how it works. 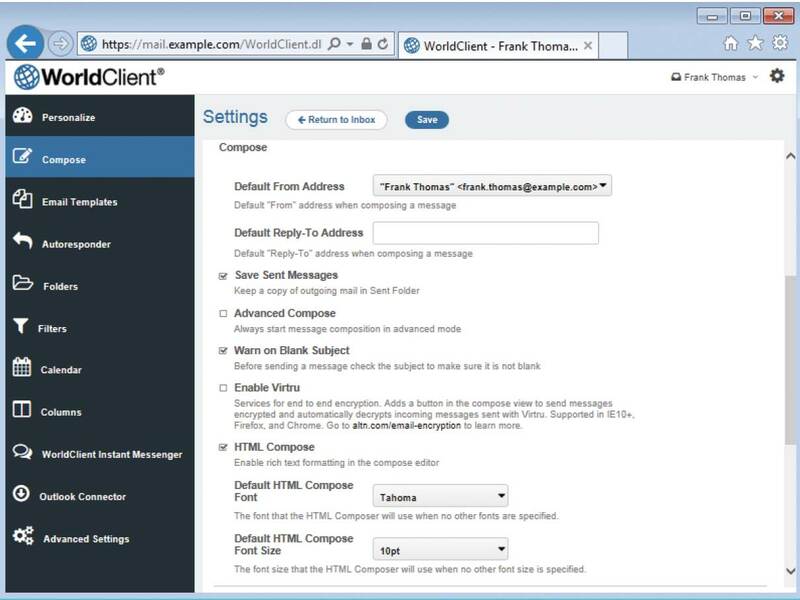 Visit Alt-N for more information on the integration with WorldClient. Visit Virtru to learn how their Email Encryption works. MDaemon now supports IPv6. Some benefits of IPv6 include more efficient routing, simplified network configuration, and additional security. 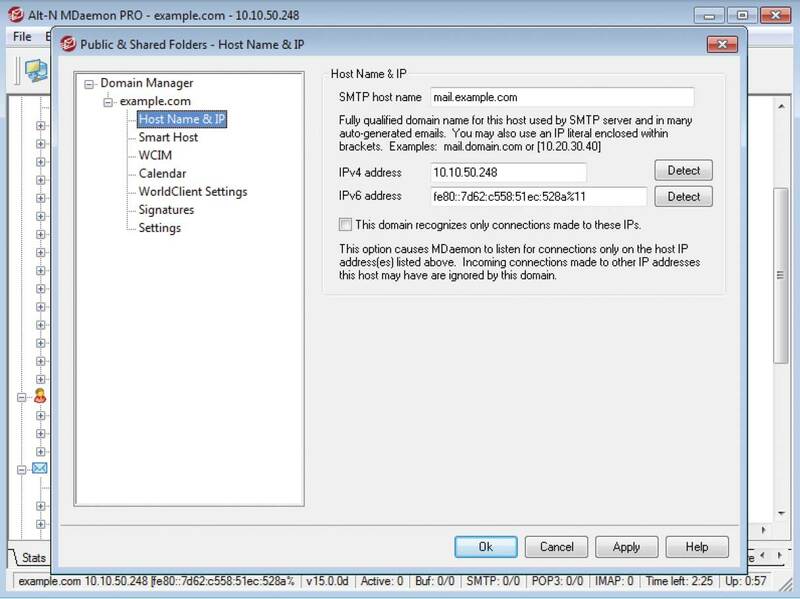 Outbound SMTP, POP, and IMAP connections over IPv6 will take precedence over IPv4 whenever possible. IPv6 addresses can be specified for each domain. 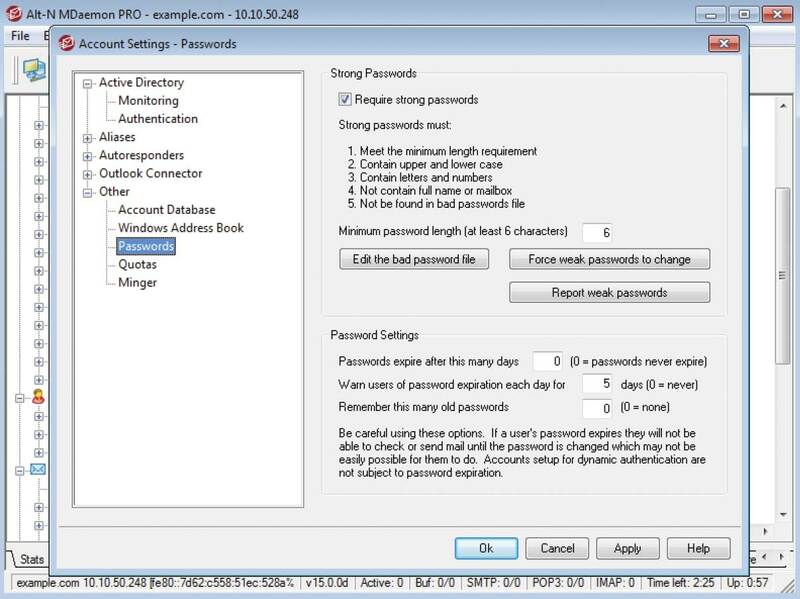 New password controls allow administrators to maintain strong password policies, and to monitor weak password usage. Administrators can now generate and email a weak password report to any designated email address. The recipient of that report can then notify those users to change their passwords as needed. Updated ACL (Access Control List) editor for customising access rights for public & shared folders. The Gateways top-level menu has been relocated to the new Gateway Domain Manager found at Setup | Gateway Manager. The Lists top-level menu has been relocated to the new Mailing List Manager found at Setup | Mailing List Manager. 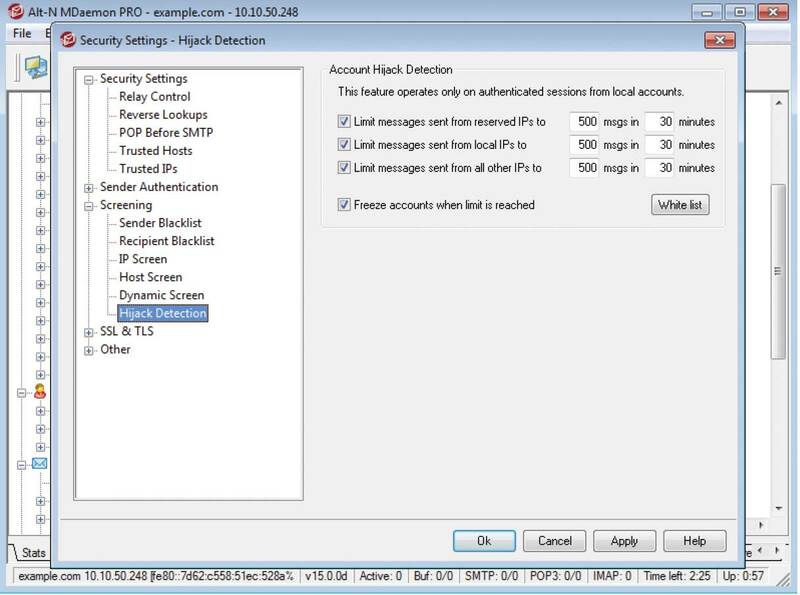 Account HIjack Detection helps prevent unauthorized access to an account when its logon credentials have been compromised. For MDaemon 15, Account Hijack Detection has been improved. Now, you can set different message and timing thresholds depending on the source IP of the incoming connection. You can also set separate limits for connections from reserved IPs, local domain IPs, and all other IPs. MDaemon is now available in 32-bit and 64-bit versions. The 64-bit version of MDaemon can handle a higher number of active sessions before running out of memory. This is beneficial in high-traffic environments where many clients are accessing and sending email simultaneously. Dynamic Screening is a security feature that can block a connection from an IP if it connects too often in a given timeframe, or if a message contains too many invalid recipient addesses. A new Dynamic Screening option has been added which lets you prevent IPs from being blocked due to multiple authentication failures if each of the failures uses the same password. This prevents a situation in which unattended devices get blocked due to not yet being configured with the new password, while still blocking password guesses. An option has been added that allows connections that fail SSL negotiation to retry connecting without SSL for up to one hour. Global administrators can now view a list of active sessions via Remote Administration. 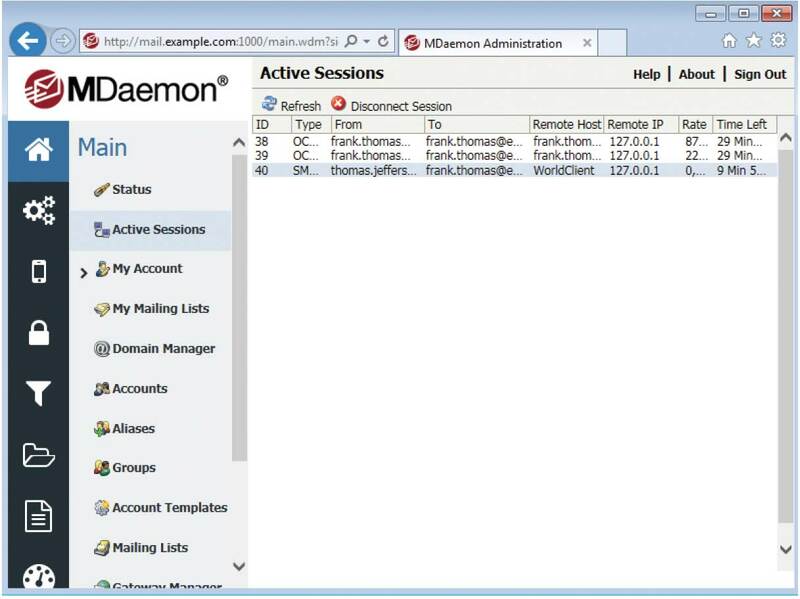 This allows administrators to see all current connection activity, including POP, IMAP, SMTP, ActiveSync, and WorldClient sessions. Sessions can also be selected and disconnected by the administrator. Watch the official MDaemon v15 video briefing from Alt-N Technologies. For all of the information relating to the changes, tweaks and improvements in MDaemon 15, you can read the release notes.